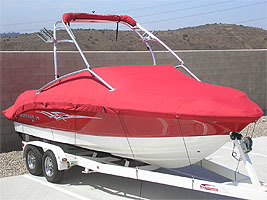 There are many different types and styles of boat covers, tops and upholstery. 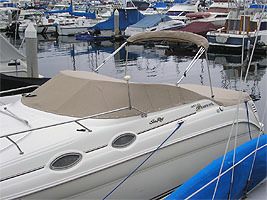 One common type of boat top is called a Bimini top, which is a type of sun shade stretched across a rigid frame that is placed over the open cockpit of a boat to provide protection from sun or rain. 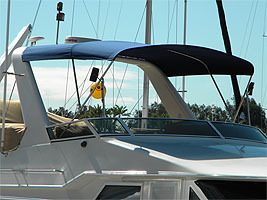 Boat Skins Bimini tops are custom made with only the best fabric. Full Enclosures and Camper Enclosures extend your boating season in the the colder months while also protecting you and your boat in the rain. Options can include various weights in vinyl, u-zipper roll up windows and screens. Cockpit Covers are a great way to protect your cockpit seating while you're away. We custom fit them to your boat and they can be attached to the top of the windshield or over the windshield for maximum coverage. Travel Covers are for boats being trailered or stored. They are easy to put on and take off. Ours includes straps with quick release buckles, critical reinforcement on all wear points and 1/4" draw rope in the hem. 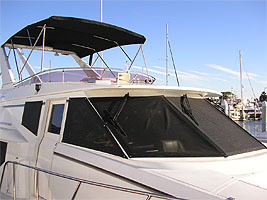 Privacy Shades and Window Covers add style and functionality to your boat. Sunbrella View reduces up to 93% of the suns heat and light keeping the interior cool during the warmer months while also providing privacy. We can recover your existing seating and rebuild seats that have frame damage from years of water exposure. We can replace or recover your V-Berth and sleeping bedding. We can replace both interior and cockpit carpet for a new fresh look. We offer many colors and materials to choose from. 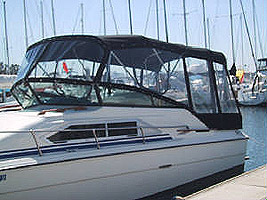 Mooring covers, Companionway covers, Engine covers and Bridge covers. 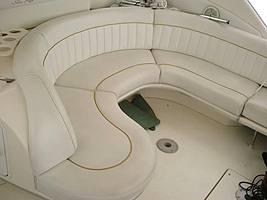 Covers for pedestals, hatches, windlass, bow seats, sun pads and grills.